"There's always a price to pay." Thad and Rachael McAlister along with their young daughter Ashley are living the life of their dreams. Thad is a wildly successful writer of horror books that have been devoured by an adoring public. In fact, he is so successful that three of his books have been optioned for movies and his latest soon-to-be published novel is already garnering the interest of film makers. On top of all this, they live in a home that anyone would envy, and Rachael will soon be delivering a brand new member of the family. Oh yes, life is very good in the McAlister household. Except that it might not be quite as good as it appears on the surface. Rachael has begun dreaming of an old woman who clicks her long fingernails together in an odd manner. This woman also keeps demanding that Rachael give her something that she claims is hers. The old woman keeps saying "I want what is mine!" The dreams are worrisome, of course, but they are nothing compared to the reality that awaits the McAlisters one morning when they awake. Something has infected their entire lawn; something ugly and odiferous. There's no reasonable explanation for it. That's only the beginning of the trials that face this family during the next three days. An evil older and more terrible than anyone can imagine has some definite plans for Thad and Rachael. This evil is determined to walk the earth once more and it will use them to do so. FORSAKEN is one of the creepiest, nerve-jangling books that I've ever had the pleasure to read. The story elicited many responses from me, all of them spoken aloud. There was jaw dropping shock; "don't look under the bed" suspense; hand wringing helplessness; and the hope that I was wrong about what was going to happen next. Seriously, FORSAKEN has everything that a devoted fan of the horror genre could ever want in a book. J.D. Barker takes an old idea and puts an entirely fresh, new spin on it. For fans of Stephen King, there is a delightful little surprise that I am not going to ruin here. Just know that you are going to love how Mr. Barker wove it into his original plotline. FORSAKEN is the first novel penned by J. D. Barker and I am deliriously happy to report that it will not be his last. He has begun what he calls The Shadow Cove Saga with FORSAKEN and I am avidly anticipating the next book in this saga. It is interesting to note that Mr. Barker also resides in Shadow Cove, Massachusetts. J. D. Barker has created a world within FORSAKEN that is enough to make you want to leave all the lights on even after you have finished the last page. There's plenty of things for you to ponder long after you close the book, and that is definitely a sign of a spectacular book. 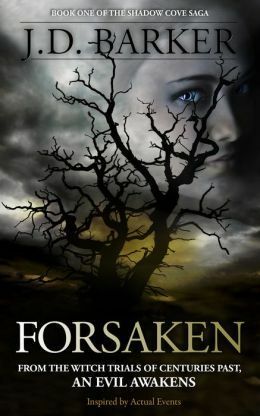 Mr. Barker may have begun by following in the footsteps of such horror royalty as Stephen King, John Saul and Dean Koontz; but he has blazed a unique path of his own with FORSAKEN. It is a path that I look forward to traveling again in the near future. At home, his wife struggles to keep their family alive. Secretly wondering if she caused it all�a deal she made long ago. A deal with the Forsaken.